Lower cost and more compact solution for variable rate piston pump drives. Users can supply their own SAE A 2-bolt motor or a hydraulic motor/PWM manifold kit is available from CDS-John Blue Company, p/n 116205-91. A piston pump allows for quick and stable adjustment to application rates within millisecond. With a piston pump your application rates won’t change with the temperature. 116205-91: Hydraulic motor/PWM manifold kit. Comes standard with 200 series flanges (-F), Viton Piston Packings, and Buna o-rings and rod packings. Pump less the sprocket. Add “-K” after model part number (i.e., NGP-4055-KF). RC40 chain 18 tooth sprocket. Add “-R” after model part number (i.e., NGP-4055-RF). RC40 chain 18 tooth sprocket. Add “-R” after model part number (i.e., NGP-5055-RDRF). Independent dual inlet and outlet. Add “-DR” after model part number (i.e., NGP-5055-DRF). Comes standard with 200 series flanges on one side and 220 series flanges on large side (-F), Viton Piston Packings, and Buna o-rings and rod packings. RC40 chain 18 tooth sprocket. Add “-R” after model part number (i.e., NGP-5655-RARF). Comes standard with Viton Piston Packings and Buna o-rings and rod packings. Upgrade option available. Pump with flanges. Add “-F” after model part number (i.e., NGP-6055-F). Pump less the sprocket. Add “-K” after model part number (i.e., NGP-6050-K). RC40 chain 18 tooth sprocket. Add “-R” after model part number (i.e., NGP-6050-R). 316SS wet-end castings. Add “-S” after model part number (i.e., NGP-6050-S). Viton wet-end o-rings and rod packing. Add “-U” after model part number (i.e., NGP-6050-U). Pump with flanges. Add “-F” after model part number (i.e., NGP-8055-F). Independent dual inlet and outlet. Add “-DR” after model part number (i.e., NGP-8050-DR). Pump less the sprocket. Add “-K” after model part number (i.e., NGP-8050-K). RC40 chain 18 tooth sprocket. Add “-R” after model part number (i.e., NGP-8050-R). 316SS wet-end castings. Add “-S” after model part number (i.e., NGP-8050-S). Viton wet-end o-rings and rod packing. Add “-U” after model part number (i.e., NGP-8050-U). 115675 – Stainless Wet-End Conversion – NGP-8050 Series. -DR pumps may use 2 single piston stainless conversion kits. Apply two products with one piston pump. Use only one drive system. 5 to 1 max ratio between pumping heads. 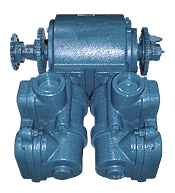 Available as a ground driven pump or run hydraulically with Variable Rate. Pump with flanges. Add “-F” after model part number (i.e., NGP-8055-ARF). Pump with flanges. Add “-F” after model part number (i.e., NGP-9055-F). Independent dual inlet and outlet. Add “-DR” after model part number (i.e., NGP-9050-DR). Pump less the sprocket. Add “-K” after model part number (i.e., NGP-9050-K). RC40 chain 18 tooth sprocket. Add “-R” after model part number (i.e., NGP-9050-R). 316SS wet-end castings. Add “-S” after model part number (i.e., NGP-9050-S). Viton wet-end o-rings and rod packing. Add “-U” after model part number (i.e., NGP-9050-U). 115676 – Stainless Wet-End Conversion – NGP-9050 Series. -DR pumps may use 2 single piston stainless conversion kits. Pump with flanges. Add “-F” after model part number (i.e., NGP-9055-ARF).